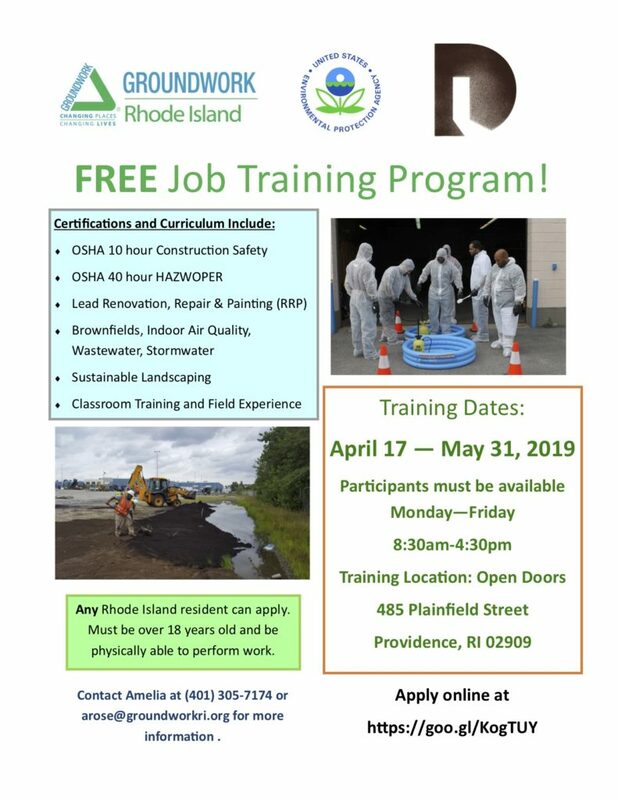 Groundwork Rhode Island’s Adult Job Training introduces local residents to career pathways in the environmental sector – particularly in the areas of brownfield remediation, lead and asbestos abatement, stormwater management, and urban land restoration. The training offers many certifications that make participants more competitive job applicants, and gives them hands-on experience in stormwater, garden, and tree planting projects that also improve the places where they live and work. By giving people the resources and skills they need to make a difference in their own communities, Groundwork is building a new and lasting force for change in participants’ own neighborhoods. Groundwork Rhode Island’s education, employment, job training and stewardship programs all serve the common goal of creating and sustaining healthy, beautiful, and resilient communities for all. Groundwork Rhode Island’s Environmental Job Training Program was developed in partnership with representatives from the environmental industry, community gr oups, the Rhode Island Department of Environmental Management (DEM), the Rhode Island Department of Health, the University of Rhode Island, the Providence Housing Authority, and many other partners. The program design process combined the expertise and lessons learned from Groundwork Rhode Island’s past Adult Job Training programs with best practices from our local partners and Job Training Providers across the country. The program is funded through the Environmental Protection Agency’s (EPA) Environmental Workforce Development and Job Training Grant Program. U.S. Environmental Protection Agency, Rhode Island Department of Environmental Management, Providence Housing Authority, Pawtucket Central Falls Development Corporation, Amos House, Community Action Partnership of Providence, RI Housing, Children’s Friend, and many more! Groundwork Rhode Island recruits highly motivated trainees from urban core communities in Providence, Pawtucket, Central Falls, and Woonsocket, with a special emphasis on serving formerly-incarcerated individuals and residents of public housing. All applicants are invited to complete an orientation with Groundwork Rhode Island before enrolling in the program. All participants must be legal U.S. residents (due to our funding restrictions), meet income requirements for free training, and/or be a displaced worker due to lay-offs or industry closures. A high school degree or equivalency is recommended but not required. We accept participants who have a strong interest in careers in hazardous materials handling/clean-up and sustainable urban landscaping, and are working to improve their own lives. Groundwork Rhode Island has been conducting Environmental Job Training since 2002. To date we have placed an average of 70% of training graduates in jobs ranging from temporary crew positions on remediation projects to full-time salaried positions with remediation contractors, Aerotek, T.F. Green Airport, Tremco Roofing, The Compost Plant, weatherization contractors, Thielsch Engineering, and others.